This story was published on page A1 of The Advocate on July 24, 2012. Here is the sidebar that details how the two Baton Rouge women ended up in Aurora on that fateful night. After a long day of surgery followed by visits from doctors, detectives and journalists, shooting victim Bonnie Kate Pourciau, of Baton Rouge, was recovering Sunday in her Colorado hospital bed when an unexpected visitor popped his head around her door. It was President Barack Obama. While standing next to Pourciau’s hospital bed, Obama told her the hardest part of his job is visiting Americans who have been wounded, both in wars and in tragedies. The president had just come from visiting others who were in worse shape than Pourciau, she said. 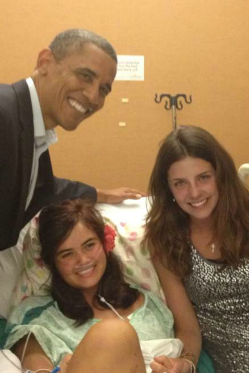 Obama told Pourciau she was an inspiration to him and he loved seeing her smile. He told her she was going to bounce back. “It was so special to be encouraged by him like that,” she said. Pourciau, 18, was shot in the knee early Friday during one of the deadliest mass shootings in American history. While on a cross-country road trip, she and her friend, Elizabeth Sumrall, 23, also of Baton Rouge, had stopped by chance in Aurora, Colo., to catch the midnight premiere of the new Batman movie. A few minutes into the movie, a gunman whom police identified as James Holmes, 24, threw tear gas canisters in the front row of the theater before unloading his assault rifle into the audience, killing at least 12 people and injuring 58 others. Pourciau and Sumrall were going to sit in the same place where tear gas canisters exploded, but had decided to watch the movie from the back of the theater instead. A bullet lodged in Pourciau’s knee. Sumrall was not injured in the shooting. A man in an adjoining theater helped Pourciau escape the building since she couldn’t walk because of her injury. Pourciau then used the man’s cellphone to call her mother and tell her what happened. Since that night, Pourciau has undergone multiple surgeries on her knee and will likely have to have more work done before returning to Baton Rouge. Even though she cannot move or eat, she said she hopes to recover enough to fly back on Thursday. “I haven’t been able to think about a whole lot because I’ve been in and out a lot,” Pourciau said. “Really I’m just so thankful, so blessed to still be here. I am gonna live. I feel really thankful that it wasn’t worse because it could be a whole lot worse,” she said. Pourciau said she has relied on her faith since the shooting. “I’m really grateful that God has protected us and preserved my life and the helpful nurses and doctors and my family’s with me,” she said. Pourciau’s parents, Trace and Kathleen Pourciau, flew Friday to Colorado.